Really, it doesn’t matter all that much to me.. I wanted to pull some awesome Flick’r birthday cake photos, and make a mosaic.. but somehow, it started feeling like work… so I decided, as a treat to myself.. to keep this simple! I’m mostly working today but will celebrate, and relax with a mini trip to Historic Downtown Richmond next weekend. How old am I you ask? Well, that will just have to be an entry for later this week.. I sense a mosaic coming on! 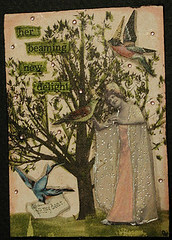 Shameless Plug: Some New ACEO’s I Listed Today… check em’ out! Trying to stick to my daily listing dental fundraiser! Dog Days – For Sale! 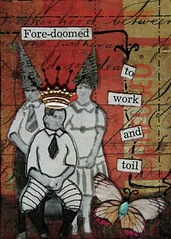 Doomed to Work – For Sale! Musicians of the Air – For Sale! 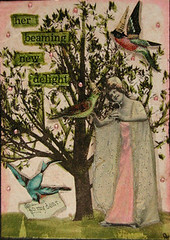 Beaming New Delight – For Sale! HAPPY BIRTHDAY TO YOU! HAPPY BIRTHDAY TO YOU! HAPPY BIRTHDAY DEAR CHRYYYYSTIIIIII….HAPPY BIRTHDAY TO YOU! btw your package is going out first thing Monday morning!!!! :) All the best to you on your special day! It is also my daughter’s birthday today, she is 15 and got a brand spanking new SLR digital!! What’s a woman to do when her daughter announces she is going to be a world photographer? Give her the tools she needs and help her to master her craft!! Thank god she didn’t want to be a mechanic! Chrysti, I hope you get as spoilt as Emily, because you SO SO SO deserve it, you wonderful soul! Happy Birthday! I love that Armstrong quote… Yea. What the hell did happen?! Well… whatever happened, I hope you had a terrific day! Happy Birthday Chrysti – have a fabulous wonderful sparkly day! So you’re coming to Richmond?? Well, you had better call me! Would LOVE to either talk to you or meet in person! I wrote you the big. long email before when you were heading to DC, remember? I don’t know if you are coming with family or not, but we could celebrate our birthdays together (mine is June 8th) and I’d love to take you to this fantastic Altered Art /Scrapbook Store that’s fairly new in the Ashland area. Have a safe trip and HAPPY BIRTHDAY! Kathy — I’ll write you an email in the next day or so! Lainey — I forgot to tell you, i think it’s awesome you giveher the tools!! You must share some of the photos she takes! Happy Belated Birthday dear one! HAPPIEST bIRTHDAY’S Chrysti!!! 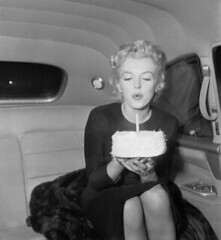 My Birthday is June 4th :0) It’s nice to share your Birthday Month with you !!! BTW I just LOVE your new ATC’s!! Whoo Hoo way to go Birthday girl!! !